Do you know what your retirement account will be worth on the day you plan to tap into it? Do you know what the tax rates will be for the rest of your life? Do you know how long you’re going to live? Most people have no clue… and that’s the problem with conventional financial planning: It’s based on things you can’t predict or control. Wall Street lost more than 49% of the typical investor’s money – twice – since the year 2000. And studies show that because they followed the conventional wisdom, almost half of all Boomers won’t have enough money to cover even basic living expenses during their retirement years. Now the financial gurus whose advice got you into this mess in the first place are telling you to “take more risk,” “work till you drop,” and “plan on spending less in retirement.” Don’t let them fool you again! 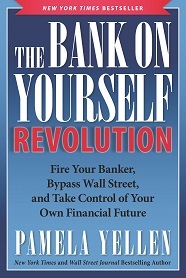 In The Bank On Yourself Revolution – a New York Times best-seller – financial security expert Pamela Yellen details how hundreds of thousands of people of all ages and incomes have bucked the system to secure their families’ financial futures without gambling in the Wall Street Casino or taking any unnecessary risks. You’ll discover a proven step-by-step plan for growing your wealth safely, predictably, and guaranteed every single year – even when the markets are tumbling. And you’ll learn how to bypass banks, credit card and financing companies to become your own source of financing for cars, vacations, a college education, business expenses and other major purchases. BONUS: You’ll also receive our FREE Ultimate Wealth-Building Guide, plus timely briefings and solutions to critical news and events that may impact your money and finances. The Bank On Yourself Revolution isn’t a “get-rich-quick” scheme; it’s about having real wealth and financial security for as long as you live. You can finally know how much money you’ll have next year, in 10, 20 or 30 years – and at every point along the way. Join the Revolution and take control of your own financial future!